Greenland with its capital is located in North America (Northern North America, island between the Arctic Ocean and the North Atlantic Ocean). It covers some 2,166,091 square kilometers (slightly more than three times the size of Texas) with 57,713 citizens. Kalaallisut, Danish and English are the common languages used in Greenland (consider regional differences). Thiscountry has no land-based border with any other country. Greenland is the world's largest non-continental island, in the far northeast of North America, largely within the Arctic Circle. If you stay on the typical tourist paths you do not need any permissions, but any expeditions (including any trips to the national park, which by definition are expeditions) need a special permit from the Danish polar centre. The topography is flat to gradually sloping icecap covers all but a narrow, mountainous, barren, rocky coast. The average density of population is about 0 per km². The climate in Greenland can be described as arctic to subarctic with cool summers, cold winters. Potential natural disasters are continuous permafrost over northern two-thirds of the island. To reach someone Greenland dial +299 prior to a number. The local cellular networks are operated on 900 MHz, 3G, 4G. Websites typically end with the top level domain ".gl". If you want to bring electric appliances (e.g. battery chaarger), keep in min the local 230 V - 50 Hz (plugs: C, E, F, K). The sign for the locally used currency Krone is DKK. 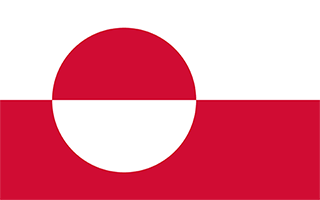 Two equal horizontal bands of white (top) and red with a large disk slightly to the hoist side of center - the top half of the disk is red, the bottom half is white; the design represents the sun reflecting off a field of ice; the colors are the same as those of the Danish flag and symbolize Greenland's links to the Kingdom of Denmark.